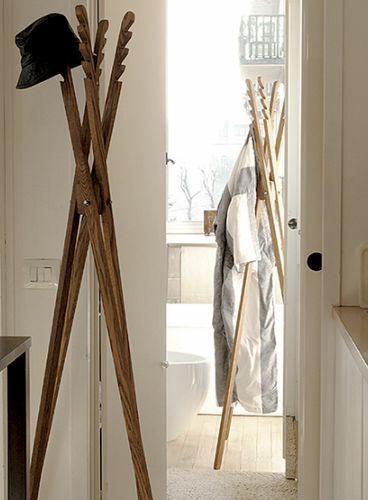 Everybody knows that a clothes hanger is used more often in winter than in summer because you never know where to hang the overcoat you don’t need in summer. When I designed this, I had in mind a tree that loses its leaves in autumn only to reveal its delicate outline which seems to have been sculpted by a woodpecker. “Picchio” is made of five very slim pieces of wood which are linked together by an old fashioned long treaded screw tightened by a normal screwdriver. This fascinatingly beautiful structure, which has a lot to teach us even today, can very easily be taken apart in only a few minutes.